Our day started at Dublin Connolly station, where a small group opted to search for the former Broadstone station. Closed to passenger traffic in 1938 (and completely in 1961), the site eventually became the administration headquarters for Bus Éireann. Soon however, it will return back to rail use with the arrival of the cross-city LUAS extension, (due for completion in 2017). We followed the progress of the works on the cross-city sections, before finding 'Broadstone' perched on top of a small rise. 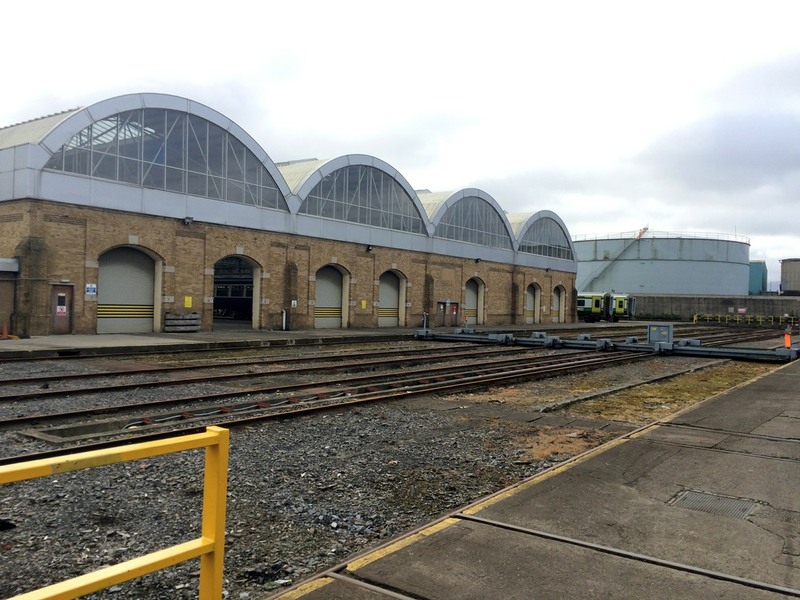 The elaborate stonework structure survives fully intact, with the former train-shed doors being utilised for entry/exit to the adjoining bus garage. Having continued our walk through the streets of Dublin, we made the short tram journey from Heuston to Blackhorse to meet the main group of members. With our group now complete, and introductions made, we walked to the depot gates for our first visit. 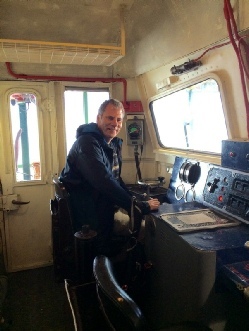 Once signed in, we were met by Brian Goold (Engineering Project Manager) who welcomed us to Inchicore Depot. Some of our group had visited 12months ago, so the operational overview was skipped, in favour of giving us more time to see what the depot had to offer. Our first stop was outside the Paint Shop, where a fully refurbished Enterprise set was parked up. 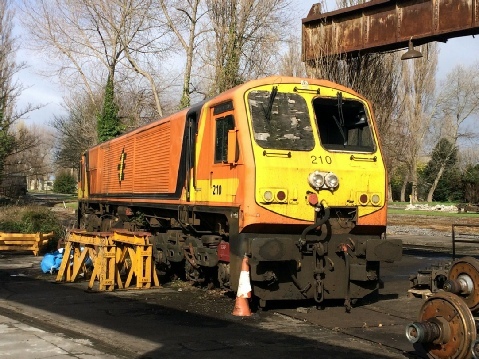 This was on the depot for staff training and familiarisation, following the De-Dietrich fleet being withdrawn for major overhaul over the past couple of years. The £12.2million upgrade scheme is all-but-complete, with the full loco hauled service between Dublin & Belfast, due to resume on the Sunday following our visit. The pool of Class 201 locomotives that work these trains have also been re-branded, with 206, 207, 8208, 8209, 227 & 228 already complete. 231 & 233 will follow shortly, although it was suggested that they will receive a revised livery, so that they can also work Dublin - Cork services if required. 230 is also in the Enterprise pool, however it is currently part way through a major re-build following an extensive fire in June 2013. 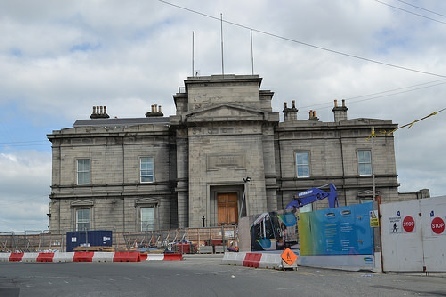 The (former) Dublin Broadstone station building survives as part of the current Bus Eireann complex, although will return to rail use as part of the northern extension to the LUAS System. 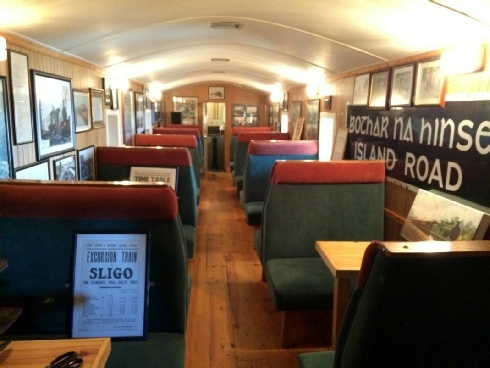 Next for us was the Fleet Casualty no.2 building, which housed several items of heritage rolling stock operated by the Railway Preservation Society of Ireland (RPSI), including the former State Presidential Saloon - number 351. A handful of Mk4 coaches were also noted inside, all of which were waiting for replacements bogies. Most of the stored locomotives and multiple units we saw appeared to be in the same locations as 12months ago. It was explained to us that the 27xx and 275x DMU's may see a return to traffic to bolster the current fleet of 26xx & 28xx units. Having been stored for several years, the exact work needed to make this happen has yet to be finalised, so exact costings may prevent it from occurring. 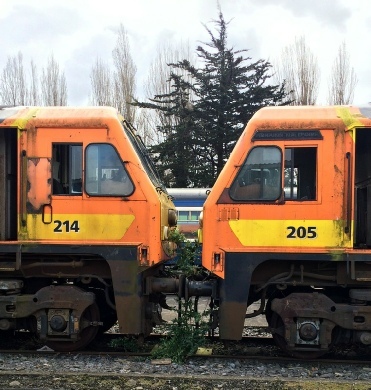 Two rows of withdrawn DART EMU's were slowly succumbing to graffiti at the far end of the depot complex, as were several wooden-bodied coaches being stored for the RPSI. Another loco just returned to use is 216. This has been purchased by Belmond for its new "Grand Hibernian" luxury train. Currently the loco is on test, and wears a green undercoat. Right: GM loco 081 is receiving new bogies and traction motors. 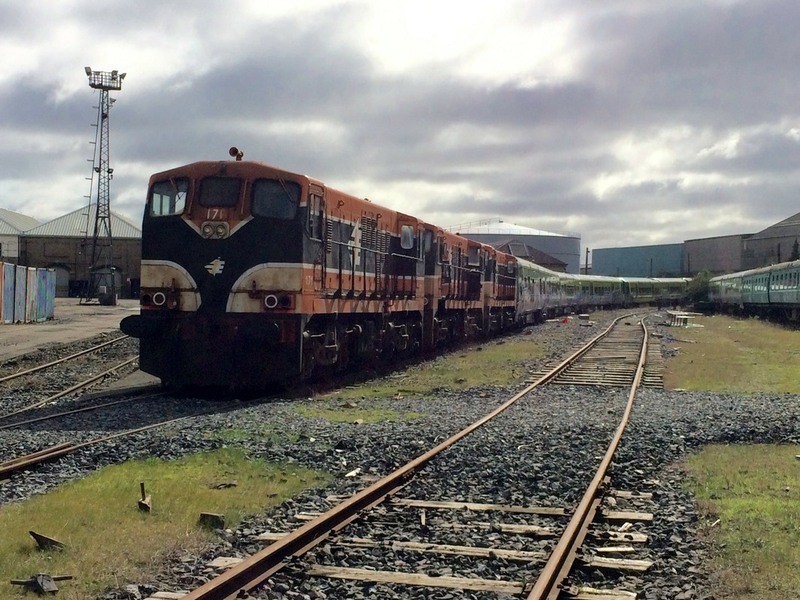 In addition, it has also been through the Inchicore paint facility for its new grey livery. The batch of non 'push-pull fitted' Class 201 locomotives have been stored for many years now. Locos 201-205 & 210-214 are non push-pull fitted. A pair of withdrawn 201 Class locomotives slowly succumbing to the undergrowth! 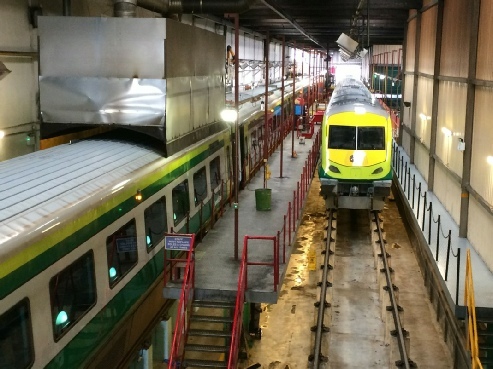 The 10 former Irish Rail Mk3 carriages also purchased by Belmond have returned from overhaul at Kilmarnock and are being internally fitted in County Antrim, Northern Ireland. Having walked briefly through the Bogie Shop, which was partly being dug up by contractors, we made our way to the Diesel Shed where several 071 and 201 Class engines were receiving attention. Guided through the raised walkways inside the Diesel Shed, we could see the rolling stock from a different angle. Certainly 40 years of heavy corrosion and rusting on the roof panels were taking their toll on the locos. 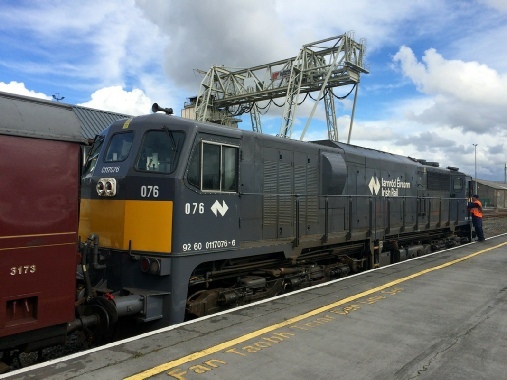 At this point, we were fortunate to witness 078 arrive via the mainline connection with a 'wagon transfer service' from Limerick. Today's consist was just two empty timber wagons! 13 out of 18 (72.2%) available for use. With the visit concluded, we made our way back to the depot entrance. Some members opted to take advantage of the adjacent canteen & snack bar before saying our final farewell to Inchicore. 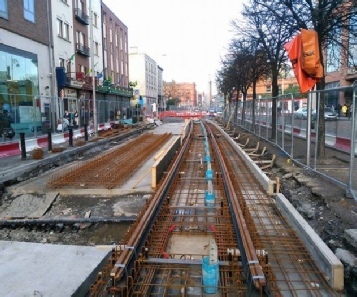 Leaving the depot, we took the LUAS back to Connolly. As we had slightly overstayed our time at Inchicore (not that anyone minded I'm sure), I contacted our afternoon host to delay our visit slightly, thus allowing the opportunity for a quick coffee break. We met our next host on the platform at Connolly station. John O'Connor (Duty Manager, Central Traffic Control), escorted us through the ticket barriers and past the former parcels area to the Dublin Area CTC (Signalling Centre). • Limerick Junction to Limerick. • Dublin to Athlone & Waterford. • Islandbridge Jn - Glasnevin Jn - Dublin Docklands. • Dublin to Greystones (on the Rosslare line). • The cross-border line as far as Newry. • Dublin to Maynooth (on the Sligo route), plus the M3 Parkway line. 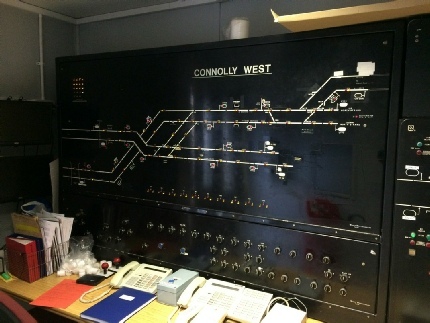 When the regional routes were transferred to Dublin control, many gate boxes were closed. Their operation was transferred to one of two regional level crossing centres: Athlone monitors 99 crossings, with Mallow being responsible for a further 75. • A level crossing panel (monitoring/controlling the CCTV crossings in the local Dublin area). • An inner suburb signalling workstation - controlling the busy DART commuter routes. 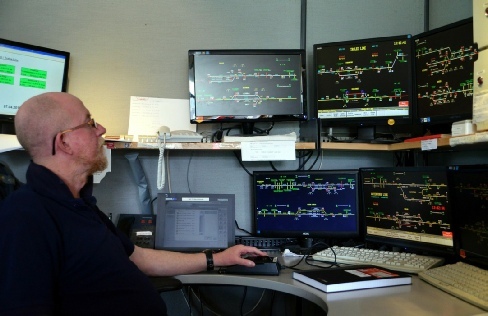 • A regional signalling workstation - controlling the Intercity routes. • An operational command dealing with delays, operational incidents, station PIS screens and other administrative matters. The former push button signalling centre, which was withdrawn from frontline use in 1986, is still 'up & running' today, and is located in an adjacent porta-cabin. An interesting oddity is that all current signallers have to keep up their competence on the older system, and are required to regulate trains with it on a periodical basis. 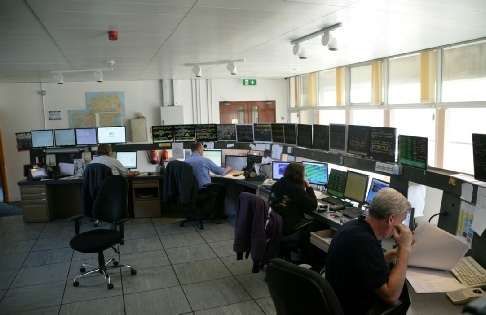 The current CTC will end its life in 2020, by which time a new control centre will have been commissioned, and will be responsible for every train across the country! Following our visit, members opted to take advantage of the free evening, with some choosing to explore Dublin, whilst others took to the local rail network. To start our second day, the group met at Connolly station to board the 09:35 Belfast 'Enterprise' service. Although we were only taking a short 30 minute trip to Drogheda, our members were invited to travel in Premier Class, thus enabling us to sample the enhanced service aboard the fully refurbished train. Certainly the Premier Class coaches have been refurbished to a high standard, and it is interesting to see them now in traffic - having seen the work being undertaken first hand at York Road Depot (Belfast) 12 months ago on our previous visit. Following the refreshments, we all too soon arrived at Drogheda, and made our way to the staff access point. Here, we were met by Brian Kirwan (Asst. 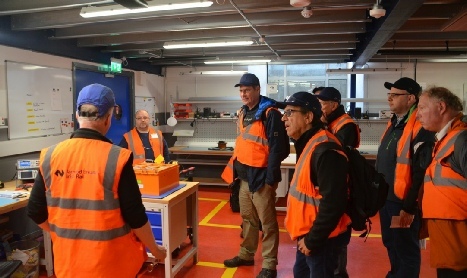 Engineering Manager), who welcomed the Institution and gave a brief overview of the depot facilities and operations. First opened in September 2002, the depot stands on former derelict land, although in the far past, the area adjacent to the station was occupied by the Drogheda steam shed. 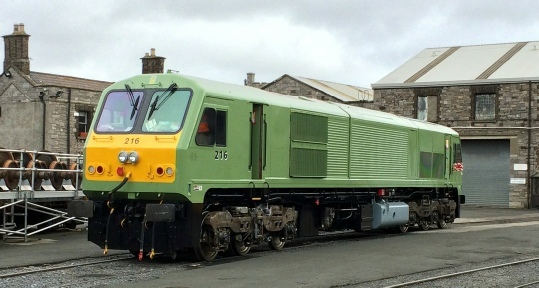 Today, Drogheda Commuter Depot is primarily responsible for the twenty nine Class 29xxx units. 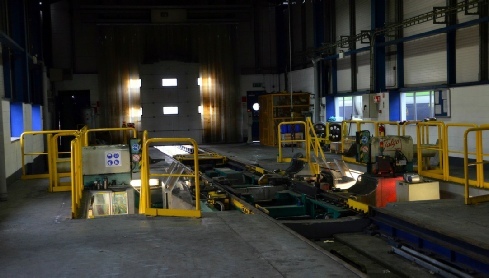 Additionally it also services Rotem railcars (ICR's), and the tyre-turning facility on site also enables it to undertake work on the DART units. 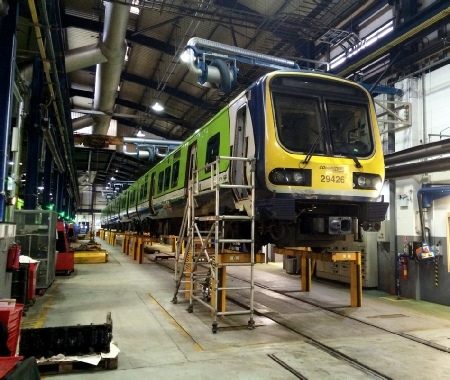 One of the purpose built test assembles within Drogheda Depot. Making our way off the station platforms, we were first guided towards the former loco shed, which now ingeniously houses a stores area and the Electronic Repair Facility. Here we were introduced to Ray Holden (Facility Manager) who gave an in-depth description of its role. This is a fairly recent addition to the depot, but is proving an invaluable add-on. The electrical work undertaken here used to be sent externally, with huge costs and time delays associated with such practices. Now, with a small, but fully skilled team of staff, repair/upgrade work on numerous items can be achieved. In addition, an apprentice scheme has been set up to create local jobs, and enhance overall skill knowledge. Being able to turn around parts in a much quicker time (and with components generally being more reliable), borrowing parts from other units should be a thing of the past. In short, the depot 'Christmas Tree' has become a distant memory! 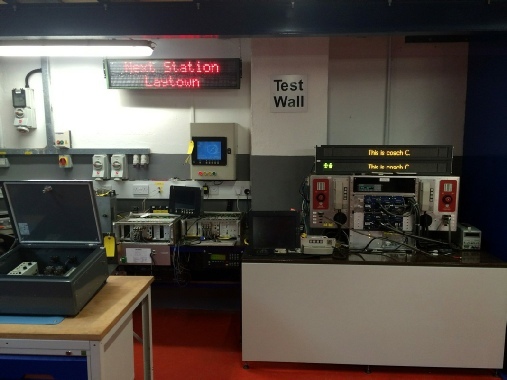 Proof that the facility is a success, can be demonstrated by the saving of around €3 Million to Irish Rail in 2014. During the day, the depot carries out fuelling, fuel point exams, and other basic checks as required. An average day shift sees 4x 29xxx units, plus a 4-piece and a 7-piece ICR on site. For a typical night shift, 10x 29xxx units are present, in addition to both the 7 & 4 piece ICR sets (plus a further 5-car ICR which covers the Belfast Enterprise duty). However, this was due to cease in the week following our visit, as the full fleet of refurbished De-Dietrich trains are now ready for traffic. With the depot track layout being fairly confined, a good deal of shunting is required to ensure everything can access the facility. Correct arrival sequences also aid the night shift! Other locations that see the 29xxx fleet at night (although only for cleaning), are Sligo and Rosslare, plus the stabling point adjacent to Dublin Connolly. B, A, B, A+, B, A, B. The A+ exam involving brake pad and lubricating oil changes. Bogie changes are undertaken every eight years, engine changes every four years, and compressors changed every six years, with a 2year mid-life overhaul in between. 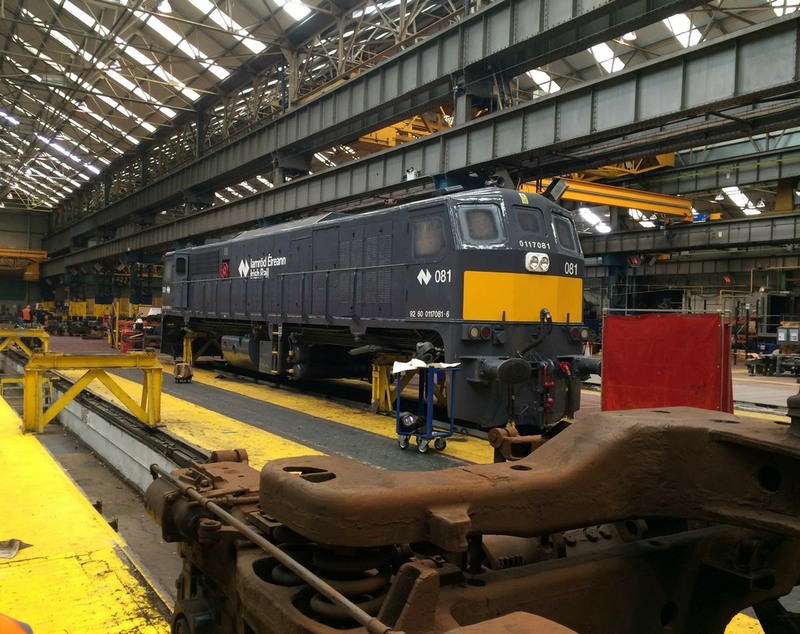 The depot also boasts a wheel-lathe facility, and is available for use by both the 29's and 3-car ICR's. The fleet of electric DART units are also handled here, although they have to be towed from Dublin by a 29xxx unit, as Drogheda is some way from the nearest overhead wire! 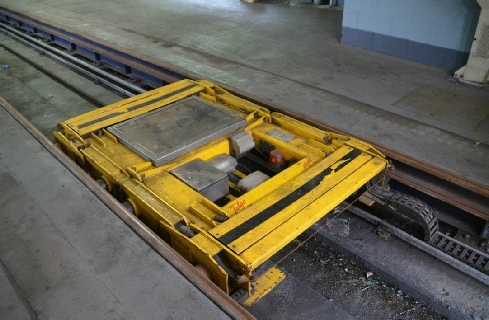 A special adaptor coupling is used to connect the two trains for this process. Next, we were shown through the 3-road maintenance building, with one road having a lifting facility for a complete 4-car Class 29. Several of the fleet we saw were in quite a poor state in regards to their livery, and it was explained to us that a handful had recently received a new all-over dark green paint scheme, but most retain the original green & white Commuter livery. 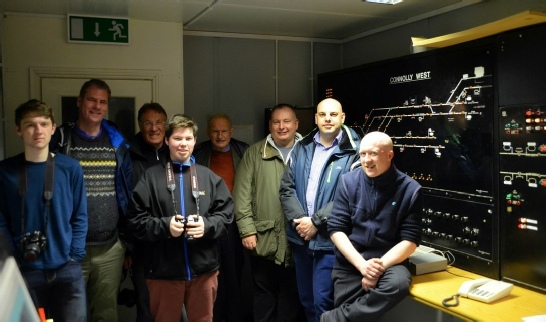 Concluding our visit, we were shown around the operations & strategy centre, which contains the vital information relating to fleet availability, maintenance schedules, and other operational matters affecting the Class 29's. Making our way back across the depot, we said goodbye to our hosts, and climbing the station footbridge (which partly spans the depot) it was clear to see the confined nature of the 10 road facility. As the saying goes, "bigger isn't always better" - as the staff at Drogheda prove. The group then returned to Dublin (some opting to take lunch in the station restaurant at Heuston), before boarding the 14:45 departure to Westport. Ahead we had a two-hour journey to Castlerea and a visit to the Hell's Kitchen Railway Museum. Arriving around 10 minutes late, due to congestion on the single line sections during the journey, we were met by Sean Browne (Proprietor and Curator of the museum). Sean and a passing friend, (who was hastily flagged down and his vehicle commandeered), took our party the short distance into the town from the station. 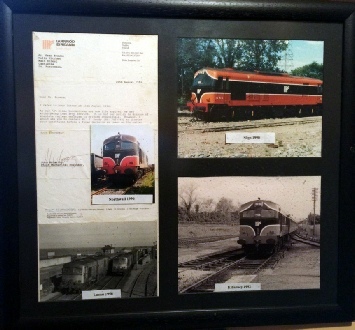 The museum at Castlerea was started as a result of an ever-growing collection of railway memorabilia that had been amassed. The museum is unique, as it is located within a public house - although it ceased regular trading around 5 years ago. However, it does still open for special events, and is even the regular home of the ladies bridge team! Pride of place goes to former CIE A Class locomotive, number A55, which Sean acquired back in 1994. A large pit was dug for rails and ballast to be laid, before the arrival of the two bogies. The body shell finally arrived in July 1998 (transported by road from Inchicore Depot, Dublin) - much to the amazement of the locals. Although both cabs still survive in tact and are fully functional, the engine room was gutted out. However, the opportunity was taken to fit tables and chairs inside for those wanting an unusual drinking environment. With the centre-piece now in place, the vast array of other items could be moved in, including station signs, signal levers, point frames, signalling tokens/staffs, station lamps, notice boards, timetables & operating notices, historical photographs & pictures...... Two railway bicycles are also in the museum, as is a 4-wheeled self propelled inspection vehicle. Not surprising in the least, is that Sean seems to be able to recall how and why each piece was obtained, and could instantly recall a story behind every part of his collection. Out of curiosity, I asked regarding the name Hell's Kitchen. Apparently it stems from the 1950's era, when after hours drinking was illegal in Ireland, and revellers would have to travel “three or more miles from their local pub” to continue drinking. Often the landlord would hide them in the kitchen - hence the name! Having spent a very enjoyable evening in Sean's company it was time to bid farewell to our host and return to Castlerea station. Our return train was the 19:17 to Dublin Heuston. A later start today, and the group met at Connolly station for the activities of the day. 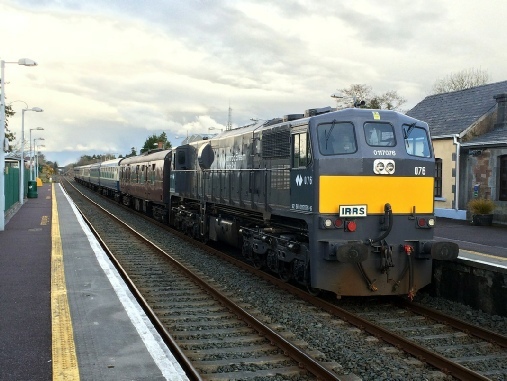 Although our educational visits had only spanned Thursday & Friday, I had opted to choose this weekend to combine activities with the Irish Railway Record Society (IRRS) and their annual railtour. The 2016 IRRS event was a two-day special charter train, being run to commemorate the 40th Anniversary of the Class 071 locomotive. A couple of our group hadn't stayed for the weekend, but we were joined by several other Institution members - increasing our number to 15 in total. The railtour was initially advertised to be routed over the Western Corridor Route from Limerick to Athenry, however, severe flooding around Ennis had totally engulfed the line for several months, thus forcing a change of route. Day 1 saw us leave Dublin and head across to Ballybrophy, where we joined the branch line to Limerick via Nenagh. Semaphore signalling and crossing boxes are a feature on this route, so our train was very much operating in the correct era. 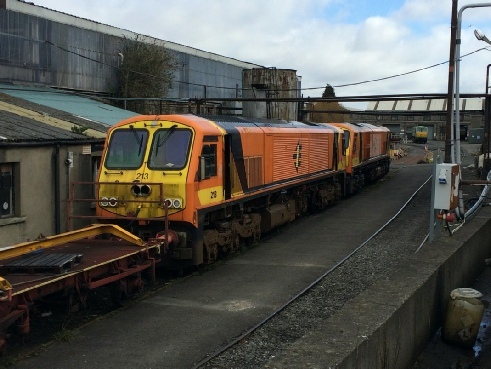 At Limerick, the now-redundant Freightliner gantry crane still stands towering over the station, as do several lines of withdrawn wagons, previously used on container and cement flows. Next it was off to Cork, before we took the Kerry line out as far as Killarney, where the train recessed overnight. Day 2 arrived (along with the first rain storm of our visit), and we departed at 08:35 for a run to the 'end of line' at Tralee. Retracing our steps, we encountered a snowy blizzard, with some areas showing substantial amounts of settled snow. Certainly this was very different weather from what we had seen in the Dublin area over the previous three days. Our speed increased as we re-joined the Cork mainline, and the Craven coaches certainly 'rock n rolled' as we powered north. Upon arrival at Limerick Junction, our loco ran round the train. The unusual station layout here has been much rationalised in recent years, but still retains its bay platform, non-platform through lines and of course, the famous flat crossing. Yet another reversal took us over the 'diamond', and on to the sparsely used cross-country line via Tipperary! 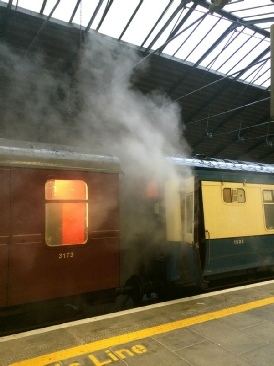 Arriving into Waterford, we had another change of locomotive. Waterford (Plunkett station) is a shadow of its former self – even from just a handful of years ago! Today, it has just one useable platform, (platform 5), and the adjacent elevated signal cabin has been obsolete since December 2013 when an embankment slip caused the partial closure of the station. Today, coupled with the closure of the line eastwards towards Wellingtonbridge & Rosslare Strand, means its future is decidedly bleak. With our new locomotive ready to go, we set off on the evening run back to Dublin heading via Kilkenny, before re-joining the mainline at Kildare. The atmosphere on board the train was very entertaining, with the Craven coaches providing a rattling-good-ride at higher speeds. The weekend charter was a great opportunity to swap stories with fellow Institution members, like-minded enthusiasts and other railway colleagues. 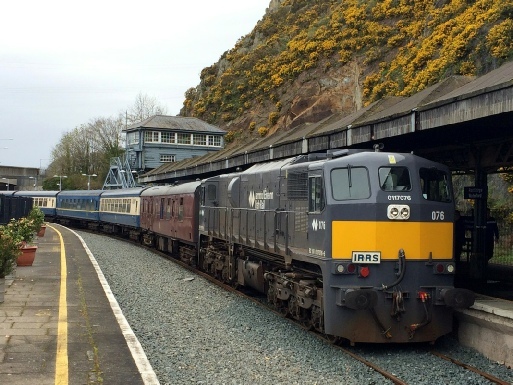 The railways of Ireland still hold some of the charms of yesteryear, (although significantly modernised over the past decade) and as we visited locations around the country, it was pleasing to see snippets of days gone by. Certainly travelling in coaches that are 50+ years old helped recreate the scene though! However, all too soon, our four days together were concluded, and it was time to head our separate ways. Again, on behalf of the Institution, I am extremely grateful to the staff at Iarnród Éireann (Irish Rail) for hosting us. Additionally, thanks must also go the Sean Browne at Hell's Kitchen for allowing us access to his unique collection. The former engine room of 055. 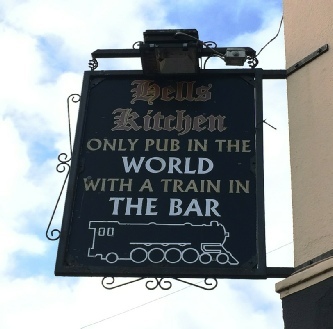 Hells Kitchen Pub Sign - the only pub in the World with a train in the bar! 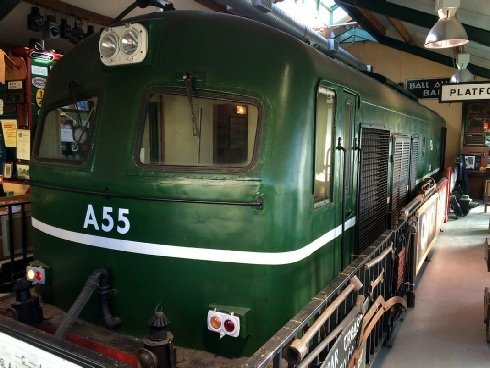 Display showing A055 in Iarnród Éireann service. Note the contents of the letter! Waterford station is now much reduced in size (and capacity). 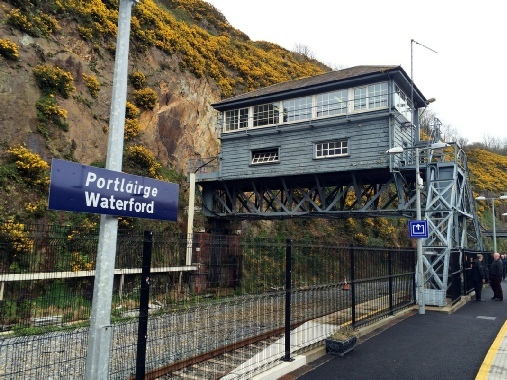 In the background is the mothballed signal cabin in its elevated position over the former through lines to Rosslare. A once common site, now rarely seen on the mainline - steam escapes from the pipes between the coaches. 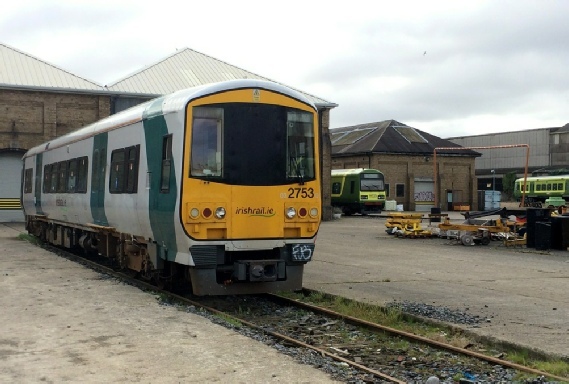 The Institution’s visit to Ireland in 2015, including a tour round Inchicore Works, Laois Traincare Facility, York Road Depot in Belfast and the LUAS Depot at Red Cow, Dublin. Our previous visit to Ireland in 1992 when, other than on the DART in Dublin, all trains in the Republic where still loco-hauled.